A while ago I showed you the first envelope pillow that I ever made. I was figuring out the process as I went and did not take photos along the way; I was too excited and anxious to see how it would turn out. 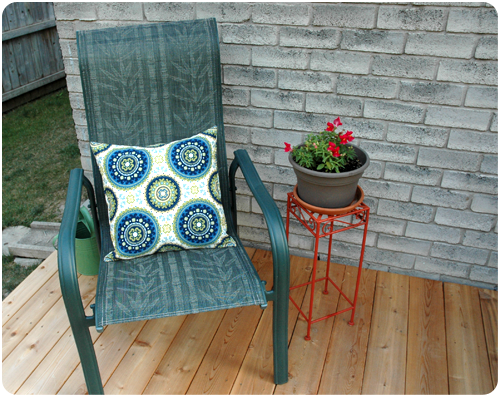 Since making that first pillow, I have made two envelope pillows for the patio chairs on my deck. I love them and am very happy with how they look. Today I would like to share with you the steps I follow to make an envelope pillow so that you can make your own. 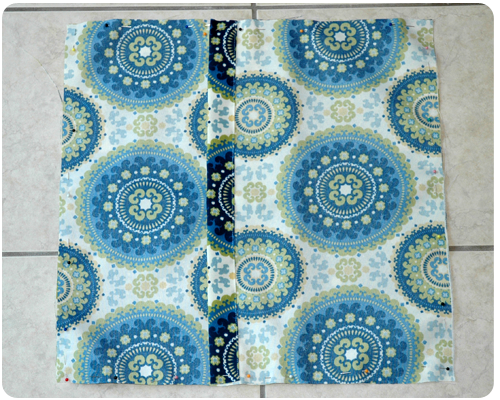 Step 1: To make a 18x18 inch pillow, I began by cutting 2 pieces of fabric, one 19x19 inches for the front of the pillow, and the other 19x27 inches for the back. 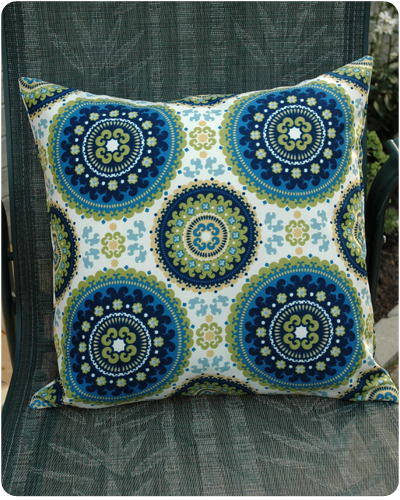 Helpful Tip: My fabric had a distinct pattern that repeated and I wanted to make sure that the pattern would be centered on the front of my finished pillow. Because of this I needed to measure and cut my 19x19 inch piece of fabric carefully to ensure that the pattern was positioned correctly. 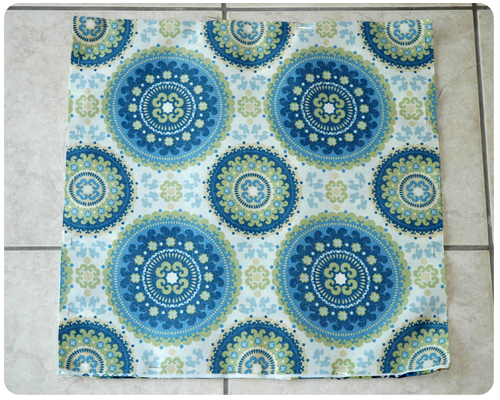 The positioning of the pattern on the larger piece of fabric (19x27 inches) which was used for the back of the pillow was not as important as you will soon see. To eliminate the need for this additional fiddling, you could choose a fabric with a more random pattern - one that no matter where you cut, it will look the same. 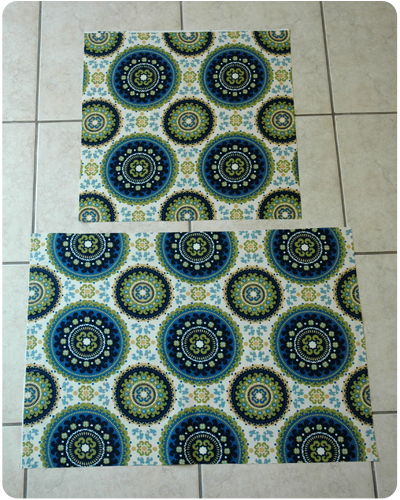 But if you do choose a fabric with a repeating pattern, consider the position of the pattern before you cut. 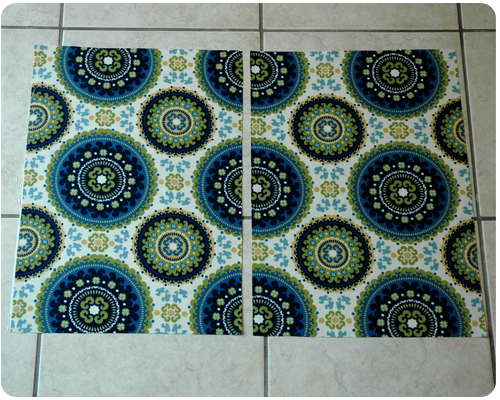 Step 2: I then cut my 19x27 inch piece of fabric in half. 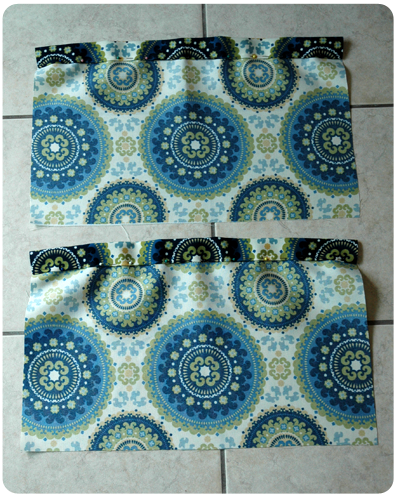 Step 3: Taking the two halves that I just made, I folded the fabric about 1 inch to the wrong side along the 19 inch edge, pinned it, and then sewed it in place using my sewing machine. I did this on each half. Step 4: Next I laid my 19x19 inch square on the table right side up. I took both of my halves and laid them on top, right side down, matching the outer edges to the outer edges on the smaller square, and overlapping the halves in the center. Step 5: I pinned everything in place and then sewed all the way around, 1/2 an inch in from the outer edge. Step 6: Next I trimmed my seams and corners. I also over-edged the seams using the zig-zag stitch on my sewing machine to keep them from fraying. Step 7: I turned my pillow cover right side out and stuffed in my form. Helpful Tip: You may want to press your pillow cover before you turn it the right way and/or before you stuff in your form. 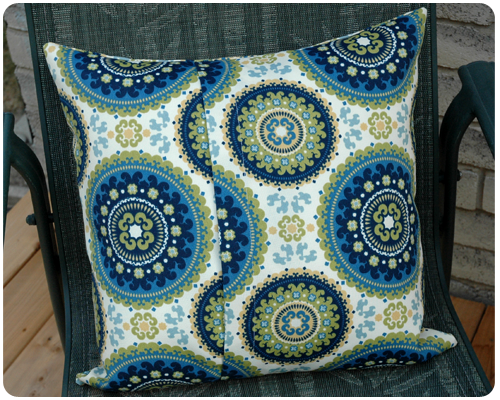 I did not press mine because I was using a fairly sturdy outdoor fabric and there were no wrinkles, but a lighter weight fabric may look more finished after a pressing. If you have any questions, please ask? I love the fractal design of the pillows. Can't wait for the summer to come.